How do you know what Heavenly Father would say to you if He were here? God speaks through a prophet today just as He did in the past. The prophet﻿—President Thomas S. Monson﻿—teaches you what Heavenly Father wants you to know and do and become. You are blessed when you listen to and follow the prophet. President Monson’s directions help us become more like Jesus Christ. Read Luke 1:70 in the New Testament. Pray to ask Heavenly Father to help you understand this scripture and know that it is true. Pray to know that President Thomas S. Monson is the prophet today. Do the activity on page 69. 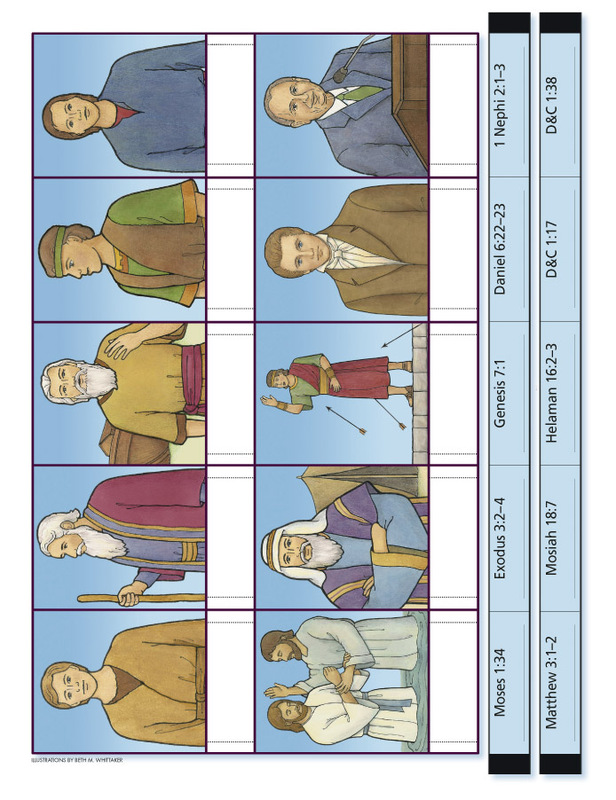 Cut slits on the dotted lines; then cut out the strips, and weave them beneath the prophets’ pictures so the scriptures line up with the pictures. Look up the scriptures to find the prophets’ names. Write the names on the blank lines. Look at the pictures of the prophets on page 69. Discuss with your family the teachings of these prophets. How does what you have done help you understand Luke 1:70? Write in your journal or draw a picture about what you have done. Thomas S. Monson, “Until We Meet Again,” Liahona and Ensign, Nov. 2008, 106. Thomas S. Monson, “Looking Back and Moving Forward,” Liahona and Ensign, May 2008, 90. Thomas S. Monson, Liahona and Ensign, May 2008, 90. Thomas S. Monson, Liahona and Ensign, Nov. 2008, 106. Thomas S. Monson, in Gerry Avant, “Prophet’s Birthday: Milestone of 81,” Church News, Aug. 23, 2008, 4. Gordon B. Hinckley, “Don’t Ever Forget to Pray,” Friend, Apr. 2006, 11. Spencer W. Kimball, “How Rare a Possession﻿—the Scriptures!” Ensign, Sept. 1976, 5.